Recently, RØDE Microphones shipped the next addition to their rock solid kit line of microphones. We’ve already taken a look at the RØDE Wireless Filmaker Kit and a host of other great RØDE mics. Now it’s time to take a look at the intimate RØDE SC6-L Mobile Interview Kit, and it could be the best of the bunch, if it weren’t for a few nasty nitpicks. 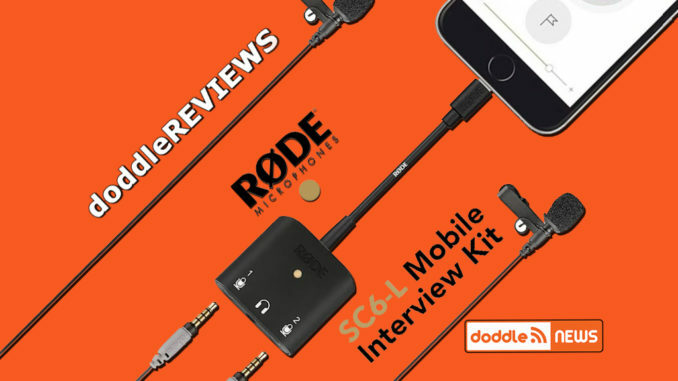 The SC6-L Mobile Interview Kit contains the SC-L dual input dongle, which plugs into your iPhone and allows you to connect two RØDE SmartLav+ lavalier microphones. There’s also a plug for headphones to review your audio recordings. The RØDE Reporter App is being hyped as the ideal app for using to record your interviews, and on its face, I would agree. It’s just a big red button, and once you set your levels in the app settings, you just hit record and you’re off to the races. In the app configuration settings, with the SC6-L plugged in, you can adjust the input level, and have the option of selecting a combined track recording, or record each microphone on a separate track. Frankly, I would leave it on combined unless you have a specific need to separate out the tracks. The reason being that when you select separate tracks, it becomes a bit like listening to it in a fish bowl since both mics are going to pick up both sides of the conversation. There’s also an input level setting that runs from low-high, and the option of enabling Direct Monitor for listening to the audio via headphones with no delay. Quality settings give the option to choose standard, 48kHz, 24-bit Wave recording, or compressed, 48kHz 128 kbps AAC recording. There’s also a compression setting that can adjust the AAC option to mp3 and anything from 128-320kbps. Nice and simple. But perhaps too simple. The real issue I have with the Reporter app is the same I had with the original RØDE Rec app. When you’re done recording, there’s only two options to share the recording …. air drop and emailing it. If the file is too big, the Reporter app offers to send a link to the recipient to download from the cloud, but you don’t know where that is, who has it, and you’re never really sure if it goes through or not. You can’t save the file to your own files section, nor can you upload to DropBox, Soundcloud or any other cloud based option. Honestly, even though the air drop option works, you’d have to have your computer with you to do it, or air drop it to someone else. And bringing your computer kinda runs counter to the whole mobile recorder vibe. Now this doesn’t mean you have to use the Recorder app. Not at all. Moreover, the RØDE Recorder app crashes … a LOT, and I just can trust that for all it’s simplicity, that my interviews will survive a crash or make it to their destination. It’s really at best, an Alpha version of what it should be, and I think RØDE should have spent more time on it’s development before pushing it out. The RØDE Rec app, for all its original flaws, has been improved and after two years, it now includes other options that include sharing via SoundCloud, DropBox, File Sharing Directly, Email, or even FTP. There’s also more recording options for professional preferences, including AIFF, Ogg Vorbis, and more. So I expect RØDE Reporter will get better with time. At the end of the day, I would recommend sticking to the higher end RØDE Rec recording app, or another app of your choice. It’s worth jumping through a few extra hoops. 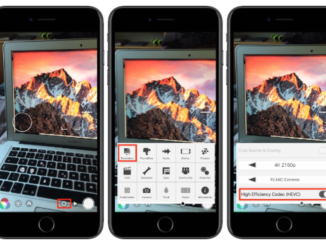 You can also FiLMiC Pro, or any other video recorder of choice, should you be doing video based interviews. A few last nit picks, and that’s the design of the SC6-L itself. 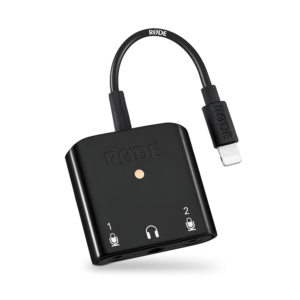 RØDE has a lightning cable attached to the SC6-L dongle, rather than just having the lightning plug coming out of the dongle itself without any additional cable. If you’re doing a lot of interviewing, I would imagine that over time, that cable is going to wear itself out to the point where you’ll have to reinvest in a new SC6-L when the connections begin to fray, which we all know happens with these cables. 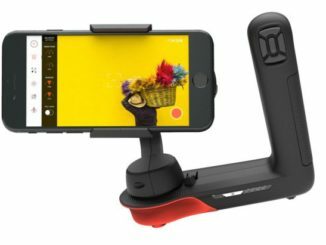 RØDE would have been better off using the lightning plug coming directly out of the unit, much like they have with the VideoMic Me-L, which can plug directly into the iPhone with no extensions. UPDATE: I spoke to RØDE about only one mic clip and they assured me that it indeed comes with TWO, not one, and that through an error of packaging, only one was included. So that is a relief. 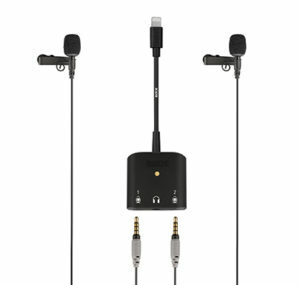 Also, the Kit also comes a pair of SmartLav+ mics, but only one mic clip? WHAT?! I thought this had to be a packing error, but if you look at what comes in the box, it only has one mic clip … FOR TWO MICS. Cmon Man! Fortunately, when testing out the Interview Kit, I was able to borrow a mini binder clip to serve as a replacement. But it was embarrassing. If RØDE isn’t going to give you what you need to attach both mics, make sure you buy an extra one! But really, these are all just nitpicks. The bottom line is that the SC6-L Interview Kit is ideal for recording interviews and podcasts on the go, so you don’t have to lug around a bunch of equipment. 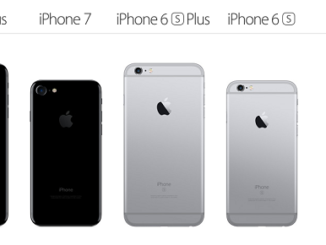 I just wish they had give it one more round of design before releasing it. Available at B&H for $199 for the Interview Kit, $79.99 for the SC6-L by itself. Or at RØDE, and other authorized dealers. RØDE Reporter App is simple to use, but has flaws.